The art of Raimund Girke. 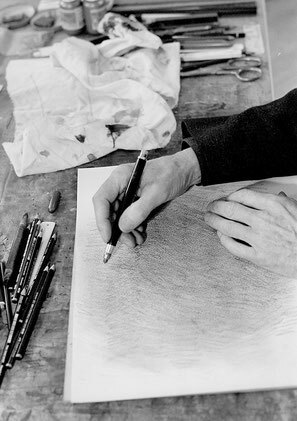 On the occasion of the exhibition marking the artist’s 80th birthday on 28 November 2010 at Galerie Fahnemann. Unlimited movement, waves of white that, starting from the plane, fill space and render it tangible – that was the dream. To fulfil it, the painter Girke restricted his means, curtailed the repertoire of colours available to him, signed himself up to white. In that he was very radical. And his triumph was that he could still show so much with it: delicately applied, mostly horizontal textures, like slats modulating the white; grey shades evolving from the basic colour, pushing towards blue; quiet processes that begin and end, captivating the viewer for a precious moment. It is as if the energy that is white is studying itself. The horizontal segmentations support this, appearing to interrupt, and doing so on purpose, because the quiet disturbance of the monochromy, like a counteracting intervention, always succeeds in bringing something new to light. Nothing like this had ever been seen before: white going beyond white and leading back to itself again. It was as if a new start could and should be made with these paintings – painting, thinking, loving, living, everything. It was then too that a process really began in Girke’s oeuvre, in the course of which the pictorial spaces changed, initially almost imperceptibly, then very forcefully in the 1980s. Monochromy was gradually abandoned, white encountered its counter-colour, black, in the pencil drawings in particular, shimmering, visually confusing zones appeared in the interplay of the contrasts. After that, in the works of the 1990s, the brushstroke became more dynamic, more assertive, edging beyond the borders of the picture surfaces. At the same time, what the artist called his “handwriting” became evident. It is this handwriting that preserves and manifests the painter, replete with his emotions and spontaneous reactions to the world, in each individual painting. In conversation, Girke once described the process as follows: Only when he had the feeling that he had entered into a painting by means of his handwriting, i.e., only when it contained or testified to a trace of himself, could he consider it as his own authentic work. The later paintings by Raimund Girke, who died eight years ago and would have been eighty this year, possess an astonishing vitality and drama. They are more agitated than the white paintings of his early years – but at the same time very much akin to them. In their rhythmic movements and the expanses they unfold, apparently facilitating an experience of heaven and of landscape and suggesting that the “ample expanse” belongs to us, the urgency and the magic of the early works are expressed again in other ways. From my many encounters with Raimund Girke what I recall most vividly is his reflectiveness. In accordance with his painting, as a person too he was always in search of a deeper reason for what he was doing and what he wanted. This guided his whole approach. It is why we miss him so much today. The artist and the man. You can say that a painter paints with white paint. This white can consist of a combustion substance like zinc white, white lead or titanium white. 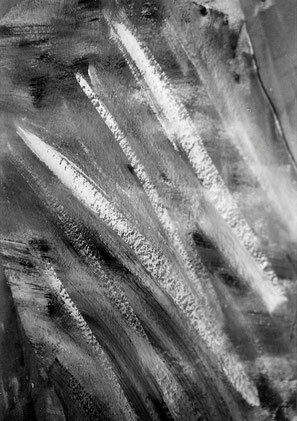 This powder is bound with resin, spread on the canvas and rhythmically structured. This way of putting things presupposes a materialistic viewpoint according to which everything is static and can be altered by man. I try to see it in a different way. It is hard to deny that white exerts a great fascination, whether you experience it at a great height in a plane, as snow in winter, or as white paint on canvas. Every artist initially has a great respect for white, as you yourself know or have heard from other artists. How often have I heard it said that before you start painting, you should dirty the white sheet because it interferes with subjective sensations and the production of these sensations. Picasso often accepted white, but inscribed an abstract human form of existence in it, the black as the receptive element, demanding light. Malevich gave this a concrete form in his black square on white. All serious monists (known to us as monks) in different cultures strove for white as the absolute experience of being, where the borders between being and non-being are blurred and a new existence looms. Space as white space, as a space of spiritual being, became evident in the cell of the Christian monks, in Islamic communities where any depiction of human or divine being was officially prohibited. Pre-Gregorian monotonous chanting attempted to articulate white in prayer. This meditative singing, which repeats and modulates one melodic line, aims at enabling man to be transported to, and merged with a spiritual realm. In Buddhism, the experience of emptiness is a phenomenological state achieved not by means of prayers or abstract spaces, but by becoming sensitized to the point of emptiness, until one is transported into the realm of the non-imaginable. 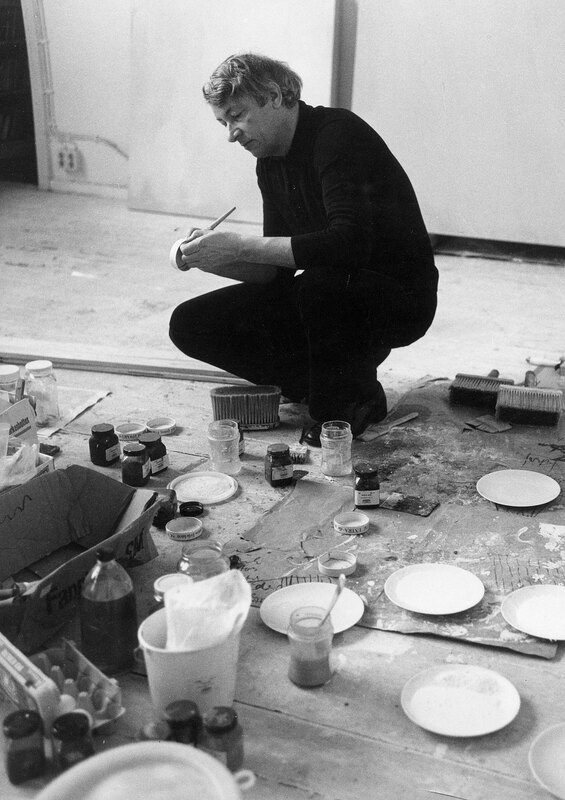 Yves Klein was able to furnish us with the experience of a zone of emptiness in a room of emptiness at the Iris Clert gallery in Paris, and in his Theatre of Emptiness. That demonstration had a great impact on very many artists, who saw white as a new idiom in which to communicate their spiritual experiences. Here man is accepted in his totality. He betakes himself to, and into that idiom, and what takes place between him and the information provided by an artist can enable him to participate, to be included in the creative process. Here man does not need to bond with a simile for himself in a painting, but can experience a visual phenomenon within himself, without translation. To return to my work: Here you see a soft staccato, a legible white zone, whose subtlety stirs our most sensitive emotions, which procures for us a new world of tiny nuances, of stillness, far from all the clamour. from Schriften Günther Ücker – Gedichte Projektbeschreibung Reflexionen, Erker-Verlag, St. Gallen/Switzerland, 1979, p. 106 and 107. The fact that Raimund Girke holds a special place in painting not just in relation to the 1960 and 70s, but today as well is largely thanks to the central metaphor of his oeuvre, which informs above all his later works: the metaphor of colour as pure energy, as light. And the colour that radiates most purely, which transforms itself, as it were, into quintessential energy, is white. “White is the colour that is closest to light.” From this it follows that for Raimund Girke “white” is not just one colour among many, even if it is the colour that gathers all the others into itself; “white” designates painting as intensity and light in general. A painting must be white for it to be pure energy. In a conversation that took place in summer 1995, during the preparations for a large retrospective exhibition which was subsequently shown at four museum venues, Girke remarked: “It has to do with my current situation, the fact that I think it all might be over in six months perhaps, so I myself must determine how that should look.” Girke thus indicated the extent to which his thoughts and actions in the 1990s, after the discovery of his illness in January 1993, were shaped by an awareness of a mortal threat to his life. This situation, caught between worry and hope, did not prevent him from working very hard, indeed in retrospect it seems that his works in the 1990s took on an existential dimension, as it were. Before a reader faced with a picture begins to analyse it, he is well advised to capture the breadth and suggestive import of the first glance. However fleeting this initial moment, it nonetheless sows the seed for a lively encounter. In their turn, the following factual and historical arguments may clarify and strengthen this experience.